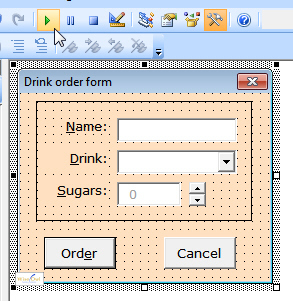 The previous part of this three-part series showed how to draw user forms; this part shows how to write macros to get them to work (the final part shows how to use some of the more advanced controls, such as combo boxes and MultiPages). 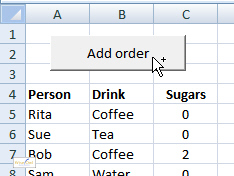 This blog is part of our Excel VBA tutorial blog. If you want classroom training (for small groups of up to 6 people), take a look at our courses in VBA. Here we're about to click on the green triangular play tool to see what the form looks like. In an ideal world the Cancel button would work too! You can attach a macro to this button so that when a user clicks on it, your form appears. This macro has to be in a separate module because the ShowForm procedure above has to be publicly exposed. Routines that you write within a form are private to that form, and nothing else can see them. 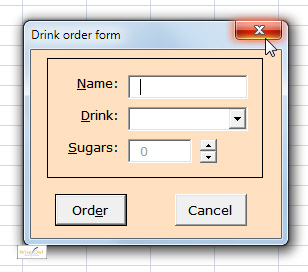 The order of events for a form is shown here. The main reason that the order of events above is important is that the Initialize event for a form will only run when it loads: so if you hide and then redisplay a user form, any code attached to the Initialize event won't run. Now we've seen how to run a form, it's time to look at getting the buttons to work - and for that we need to look at form events.